To reduce the potential damage caused by earthquakes, past methods increased the building rigidity by adding shear walls or braced frames. 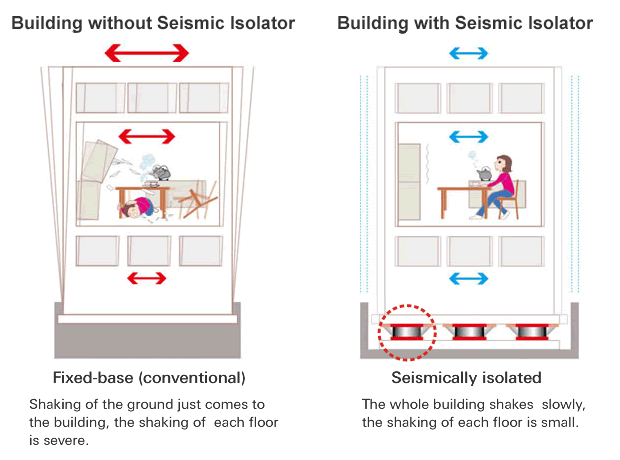 The “Seismic Isolation System” is a flexible approach for isolating the structure from the ground, reducing seismic shock propagation into the structure. In addition to reducing the chance of structural damage, the “Seismic Isolation System” also minimizes secondary damage to equipment inside the building such as computers, precision instruments, medical equipment and communications systems. The “Seismic Base Isolation System” is installed between the ground and the upper structure. The isolated rubber bearing proven to be an ideal solution for seismic base isolation. For better understanding, please click HERE to watch the demonstration videos.